What category of information are you looking for? Q: Are you the owners? Who runs Kawishiwi? A: My dad, Frank Udovich Sr., bought Kawishiwi in 1978 when he outbid the USFS for it. Now Nicole Udovich and I, Frank Udovich Jr., own and operate it. We have been running Kawishiwi on our own since 2008. Q: When did this place start? Have you been here for a long time? A: John Zgonc started to build the first cabin here in 1916. He started to rent cabins in 1924. He, his sister, Molly, and brother, Frank, ran the resort until 1978. Q: What is Lake One like? A: Lake One is about 3 miles long with many islands and bays—one of the most beautiful lakes we have ever been on. We never get tired or bored of exploring it. It is a near perfect paddling lake, with many places to find shelter from the wind, and small enough that the wind is not as much of a factor as on most other area lakes. It is big enough that a week is just enough time to learn it. Q: Are there any other resorts that are canoe-only? A: No, we are not aware of any other resorts (in the world!) that are legally required to prohibit motorboats. Q: We are looking for a place our family can come year after year. Is Kawishiwi Lodge "family-friendly"? A: Yes, we are family-friendly (especially with the fire pits at every cabin that allow for endless story time and laughs)! We have a long list of guests that have made Kawishiwi their second home for years—some for as many as 4 generations, and we have many weeks each summer where all of our guests are returning guests. Kawishiwi Lodge is the resort to come to year after year. Q: What can the kids do? A: Canoe, swim, kayak, hike, play in the lodge, etc. There are no motorboats, so swimmers never have to fear oncoming boat traffic. Kids take to the kayaks extremely well, and they are small enough for even the smallest kids to handle. If your children have the opportunity to paddle a kayak here at Kawishiwi, they will be talking about if for years to come. Q: How is the fishing? A: Northerns, Bass, and Blue Gills are always biting. Walleye are a little harder to catch after about the end of June. A: All you should bring - other than your clothes & personal toiletries - is kitchen & bath towels, all paper products, trash bags, and your favorite food. Here’s are two useful checklists for your convenience: our cabin packing list and our BWCA outfitting packing list. Q: Do you sell bait? A: We sell leeches and crawlers by the dozen, but we do not oxygen-pack them. Leeches are in good supply through August, but may be in short supply starting in September, so if you’re coming later than August, we recommend buying them before your arrival just to be safe. A: Ely, but we do sell beer,pop & snacks! A: Our hours are roughly 8am-6pm, although we can be flexible. We only ask that you be respectful, as we have families, too! If you are arriving late or early, please make an appointment (special appointments will not be made if you are only picking up permits). A: 19.5 miles east of Ely on the Fernberg Rd #3187. Do not go down Highway #1 or the Kawishiwi Trail! You can find directions to Kawishiwi Lodge here. Q: Are you actually located on Lake One? A: Yes, we are looking at it right now! Our bunkhouses, canoe pile, and canoe gear are just a few feet from the water's edge. You could drive your car right into the lake at our landing, if you wanted to! A: Always nicer here than just sitting at home. It rains here every few days no matter the season. You can check out our helpful BWCA links page for fire ban info and weather conditions. A: We have Wi-Fi in the commons area of the lodge only, which is open for use 24 hours-a-day. Q: Do you have TVs or phones? A: No, we have no TVs, phones, or radios. If you need a phone, we have one in the commons area of the lodge. It is open for use 24 hours-a-day, but you’ll need a calling card to dial long distance. A: Barely, if at all. Q: Do you serve other entry points? A: Yes! We deliver canoes at no additional charge to Moose Lake, Wood Lake, Ojibway Lake (entry point North Kawishiwi), Snowbank Lake, and Fall Lake. We can also deliver to other lakes for a fee. Q: When do you fill up? A: All of our Kawishiwi cabins are fully booked up for at least 12 weeks a year to as many as 18 weeks a year. If you want your pick of cabin, we recommed calling a year ahead (generally, you can get a mid-summer cabin by calling us in January or February), however there are always a few last-minute openings, due to cancellations. Please do contact us regarding last-minute reservations, as we do tend to have last-minute vacancies every year. Q: How often do people cancel? A: There are always a few cancellations, and we do our best fill the cabin with those guests on our waiting list. Q: How early can I check in? A: It depends on which Kawishiwi cabin you’ve rented. For Cabins 1-14, you can check in anytime starting at 3pm. For Cabins 15-18, you can check in anytime after 5pm. We are closed every Saturday from noon to 3pm for resort clean-up. Q: Can I have late check out time? A: To give all of our guests the same amount of "cabin time", the Kawishiwi cabins with later check-in times also have later check-out times. For Cabins 1-14, check-out time is 9am. For Cabins 15-19, you can check out as late as noon. A: Sorry, we DO NOT allow pets in the cabins. We do, however, allow pets for 1 night per visit with groups staying in our bunkhouses (there is still a charge if the pet sleeps in the truck). The cost is $35 per pet per night. Q: Is there a limit to the number of people that can stay in each cabin or bunkhouse? A: The management reserves the right to limit the number of people per cabin for safety and comfort. Q: Is there a deposit to stay at Kawishiwi? A: Yes. A $300-$500 per cabin (depending on the cabin) or $140 per bunkhouse per night non-refundable deposit is required with your reservation. Q: Tell me more about the bunkhouses. A: The cost to stay in one of our bunkhouses is $35 night per person, with a $140 minimum (and you are the only group that stays in the bunkhouse). They have full kitchens with utensils & cookware and bathrooms with showers. A stay at one of our bunkhouses includes showers at the end of your trip, garbage disposal after your trip, and safe parking. There is a $10 one-time fee to launch a canoe that is not ours. Q: Do you sell Fishing Licenses? Q: What is the story on BWCAW permits? A: As we have no special access to permits, we use the same website and phone numbers as you to order permits. There are a limited number of overnight permits, so it is best to plan ahead. We work with groups as early mid-January for permits and trip planning. You must enter the day and entry point designated on your permit. Q: What about day permits? A: There is no cost and no quota for day permits. You pick them up at the lodge and fill them out, and you are good for as many days you are staying at the lodge. 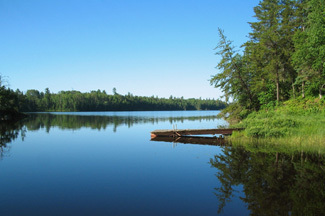 You cannot use day permits to overnight camp in the BWCAW.